When he was 15, Brit Nick D’Aloisio had an idea for an app that summarized news articles, offering readers in a rush a quick way to catch up on the day’s events. The free app, Summly, launched for the iPhone last November and soon became a big hit, with Apple naming it one of its favorite apps of 2012. Yesterday, it emerged that D’Aloisio, now 17, has just sold it to Yahoo for a reported $30 million (£19 million). Now, for those who don’t have it on their iDevice, forget rushing off to the app store to check it out. Yahoo has already closed it, with the web giant planning to use the Summly’s technology in its own news-delivering apps. D’Aloisio and his team will work with Yahoo at the company’s London office to help incorporate Summly functionality into Yahoo’s mobile offerings. Speaking to the BBC about the sale, D’Aloisio said he was “really excited” about the way Yahoo was going under the new leadership of Marissa Mayer, the woman brought in by the Yahoo board last year as it seeks to turn its business around after several years in the doldrums. The modest teen said selling the app for millions was “like a dream”. The idea came to him when he was studying for exams a few years back. Frustrated by the inefficiency of clicking back and forth between articles on Google, he came up with the idea of offering summaries to news items. “I realised there was all this information on the Web but it had not been ordered. That’s when I had the idea for an algorithm that would summarise the results of web searches automatically,” D’Aloisio explained. When the app first launched in 2011 with the name Trimit, it soon picked up funding from venture capital firm Horizon Ventures, with further financing coming from the likes of Yoko Ono and Ashton Kutcher. 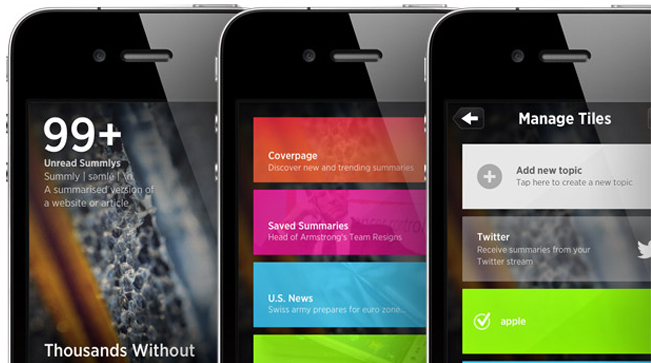 The money enabled him to refine the app, which relaunched as Summly four months ago. Despite the big payout from Yahoo, D’Aloisio has no immediate plans to go on a wild spending spree. “I like shoes, I will buy a new pair of Nike trainers and I’ll probably get a new computer but at the moment I just want to save and bank it,” he said. He’s also still intent on going to university, though with Yahoo-related matters about to take up much of his time, it looks like he may have to postpone that for a few years.